And you thought $600 toilet seats were bad. Photo by flickr user <a href="http://www.flickr.com/photos/tracy_olson/61056391/sizes/l/" target="blank">Tracy O</a> used under a Creative Commons license. This is Part II of a Mother Jones special report on the defense budget. 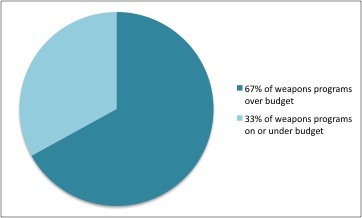 Click the links for Parts I, III, IV and V.
Let’s start with the biggest no-brainer of a problem: the Pentagon’s mind-boggling budget blowouts. That is, setting aside for a moment the question of which weapons the DOD should or shouldn’t buy, how much money does it waste? 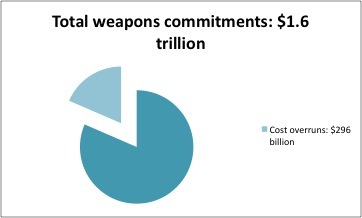 In 2008, the Pentagon calculated that its existing weapons commitments will ultimately cost the government $1.6 trillion. A big chunk of that total—$296 billion, to be exact—is cost overruns. That $296 billion doesn’t come from a few big programs running over budget and messing up the balance sheet, either. Blowouts are the norm, not the exception. In other words, almost nothing about Pentagon contracting works as it should. It would be tempting to blame all of these excesses on the Bush administration’s lax attitude toward oversight: Overruns and delays definitely got worse between 2000 and 2008. But if you take a look further back, you see that overruns have increased at a predictable clip over the past 15 years—an average of 1.86 percent a year, to be exact. If Pentagon spending continues at its current rate, average overruns will reach 46 percent in 10 years. There has been much fanfare about Gates’ spending “cuts,” and there will be a brief obsession with whatever Congress approves when it eventually passes a defense budget. But even if Congress resists the urge to stuff the bill with pork and gives Gates everything he wants, real Pentagon spending will inevitably be far, far higher. 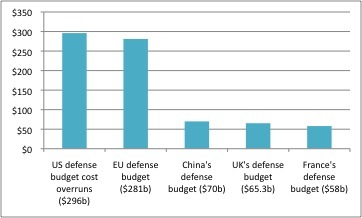 That’s right: China, which was the world’s single second-biggest defense spender in 2008 after the US and supposedly such an existential threat that it justified the purchase of obsolete and exorbitant weapons programs, spends less than a third of what the Pentagon is wasting. Part V: Mission Impossible: Is Defense Reform A Lost Cause?